My name is Valeria. 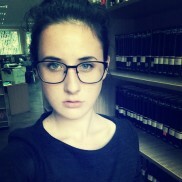 I am from Donetsk but now because of some political problem I live and study in Kiev. Iam a sophomore. I study social science. I am very interested in it cause I think that people and society are very interesting phenomenons and I want to study and understand it better. My sociabilite helps me in it. Also I am very creative person. I have a good imagination and I always draw some scetches. And the third and I think that the best of my characteristics is my sence of humour what makes me optimistic and make my friends' mood better. I study sociology science and PR in the University.But I also good in art, I have finished art school and I ave been drawing for 13 years. Also Im worried about enviroment. I used to be at university eco-club.